WinAir of London, Ont., plans to unveil its Dashboards enhancement at the National Business Aviation Association’s (NBAA) convention and exhibition running in Orlando, Fla., from October 16 to 18. The company explains the enhancements will be available as an add-on option for all new WinAir Version 7 packages (Operator, Heliops, MRO, CAMO, Custom, and All Inclusive), and to existing clientele with specific modules in their current package. With the Dashboard enhancements, clients can display their data – on any connected screen from a desktop monitor to a mobile device – using a variety of gadgets in formats like pie graphs, bar graphs and line graphs. 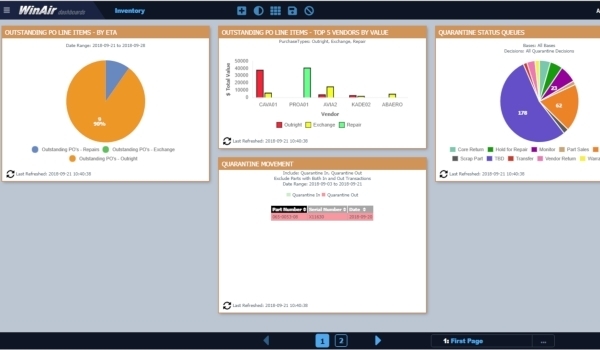 Dashboards, explains WinAir, are designed to assist with improving operational efficiencies, expediting processes, and producing savings in a maintenance budget. WinAir users can configure their own unique dashboards based on the gadgets that best fit their particular department, job role, and/or operation. System parameters can determine which members of staff have the ability to set-up and manage Dashboards. WinAir explains that when placed on the hangar floor, in a Stores Room, or in a Management office, a monitor displaying Dashboards will provide employees with an array of valuable information – this data can then be interpreted, assessed, and acted on. At present, WinAir has developed numerous gadgets that utilize information from a client’s Maintenance, Inventory, Accounting, Administration, Reliability, Part Sales, and Real-Time Labour Tracking modules in WinAir. • Low latency real-time data: Companies have access to low-bandwidth, highly visually representative, live data that is updated on a cyclical basis. • Aircraft Defects Per Flight Hours: The Aircraft Defects per Flight Hours Dashboard gadget provides users with the ability to view the number of defects by ATA Chapter for a specific template or aircraft per the number of flight hours and date range specified.